As a part of our celebration of Pentecost Sunday at Orchard Baptist we finished the service with a prayer response using candles. 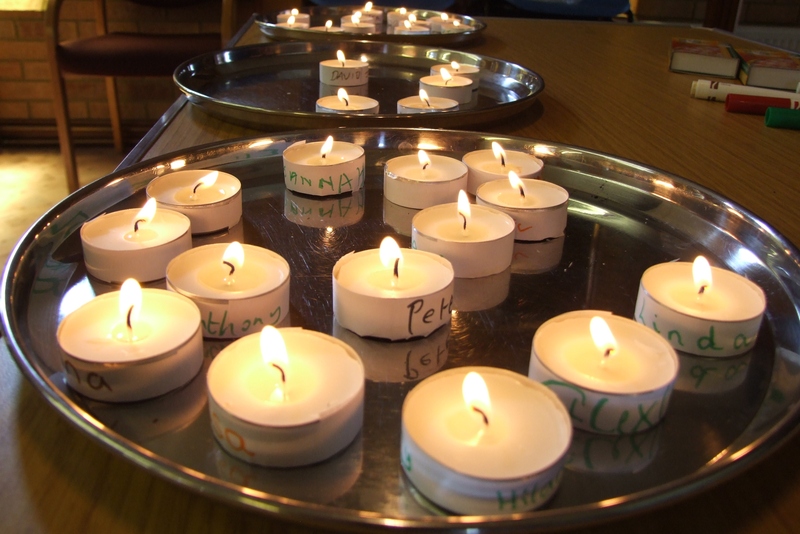 People were invited to pray a prayer asking to be filled with the Spirit before writing their name on a tealight and then lighting the candle. The lighting of our candle symbolized our willingness to receive the Spirit and for him to shine through us. After the activity there was also the opportunity for people who wanted to to be prayed for to receive the Holy Spirit. One of the best things about this activity was that I didn’t organize it and it is encouraging when we see the gifts of others being used in church rather than just church leaders taking a lead :). The Holy Spirit is God’s presence in us and as he fills us, his light and presence will illuminate our lives and transform us. Sadly though, we often try and cope alone when God longs to refill us with his presence constantly. Will we call on God to fill us afresh so that we might rely on him and not ourselves? As we shared the candle activity and prayers, we used this song to help focus us. You might find it helpful to listen to it if you would like to ask the Holy Spirit to fill you now. This entry was posted in creative communication, Faith, God is with us, Holy Spirit, Relationship with God and tagged all age service, candles in prayer, creative communication, creative prayer, day of pentecost, filled with the spirit, holy spirit, pentecost, prayer response, receive the Holy Spirit, rely on God. Bookmark the permalink. Absolutely beautiful and inspirational! Thank you for sharing.